VA Secretary Dr. David Shulkin is expected to discuss care coordination. 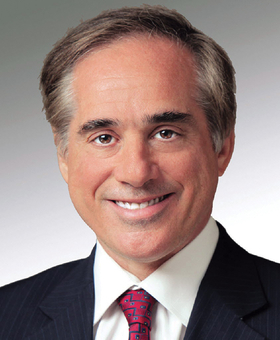 In the past few weeks, Veterans Affairs Secretary Dr. David Shulkin has faced scathing criticism over a number of alleged ethical lapses including accepting free tickets to Wimbledon. Late last week, two top Democrats on the Senate Veterans' Affairs Committee said "chaos" within the department was affecting care of the veterans the agency seeks to serve. Shulkin this week will get a chance to distance himself from D.C. as he joins healthcare executives, technology vendors and others gathering in Las Vegas to talk shop and hear about the latest and greatest in health IT. The Healthcare Information and Management Systems Society's annual convention and trade show, which runs March 5-9, is expected to draw 45,000 people this year. About 42,287 attended in 2017. Shulkin is slated to speak Friday morning with Vice Adm. Raquel Bono of the Defense Health Agency and address coordinated care. Former executive chairman of Alphabet (née Google) Eric Schmidt, who spoke at HIMSS in 2008 when Google launched its now defunct personal health record, will talk about how to implement technology effectively in healthcare and how to more quickly transform the industry. "You see a pattern here—there's more of a 'roll up your sleeves and deliver' mentality," HIMSS CEO Harold Wolf said. To that end, Wolf expects conference attendees, speakers and exhibitors to focus on using information technology in care delivery. "How do we put into the hands of both the clinician and the administrator more tools that help them understand end-to-end delivery and the value of it?" Wolf also expects artificial intelligence to garner attention this year, as it has in the past two or three years, as well as cybersecurity, which he called "more important than ever." These topics all play into the goal of coming up with new ways to deliver care. "I think the biggest issue that everyone is facing right now is how do we use digital health effectively? How do we take care of individuals outside the walls of the encounter-based paradigm?" Wolf said.